1938: Trump meets Hitler at Munich: "Peace in our time"
Trump previously described Hitler as a "maniac," "madman," and "sick puppy." MUNICH, GERMANY. Sept. 30, 1938. Standing on the tarmac at Munich International Airport early this morning, sleepy-eyed President Donald Trump waived a copy of the Munich Agreement to a group of reporters and declared: "Today is the beginning of an arduous process. Our eyes are wide open. This comprehensive document guarantees peace with honor. It guarantees peace in our time." With that, he boarded Air Force One for the return trip to Washington. Earlier, speaking informally outside the Fuhrerbau, Hitler's Munich headquarters where the pact had been signed at 1:30 this morning by Germany's Adolf Hitler, Italy's Benito Mussolini, Britain's Neville Chamberlain, French Premier Edouard Daladier and Trump, the president was asked what he thought of German chancellor Hitler, whom he has previously described as a "maniac," "madman," and "sick puppy." "I had a heartfelt conversation with Hitler. He's got a great personality. He's a funny guy. He's very smart, very talented. He's a great negotiator. He loves his people, not that I'm surprised by that, and they love him with great fervor." Trump then added: "I knew in the first minute that he was sincere." When CBS reporter William L. Shirer challenged Trumps assessment of Hitler, the president retorted: "Anybody that takes over a situation like he did and is able to run it and run it tough, well I don't say he was nice, but he ran it, few people could have done that." "Does that really mean 'Peace in our time'?" a skeptical Shirer asked. The president bristled, replying, "Anyone can make war, but only the most courageous can make peace." An unidentified financial reporter asked about the shaky German economy and its potential impact on the peace agreement. "War preparation is good for the economy. Will Germany, and Hitler, survive on a peacetime economy?" Trump's response reflected his own financial interests: "Think of it from a real estate perspective," as he talked of building hotels in Germany at their beach and alpine resorts. 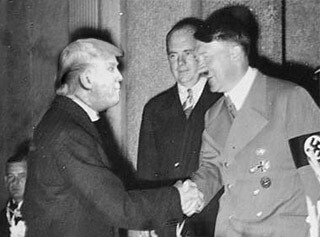 As the conference came to an end in the wee hours of the morning, Trump and Hitler posed for photographers, a smiling Hitler firmly gripping Trump's hand. An expert on body language noted that Hitler's hand was in a dominant position, entrapping Trump's.